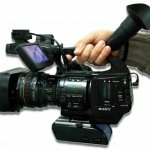 Batería universal para camcorders, cámaras de mano y cámaras DSLR . Voltaje nominal: 14,8 V. Capacidad: 65 Wh. 4 salidas de corriente D-TAP simultáneas. Dimensiones: 139 x 76 x 46 mm. Peso: 0,65 Kg. Incluye 1 cable D-TAP a elegir y cargador rápido (2 h). 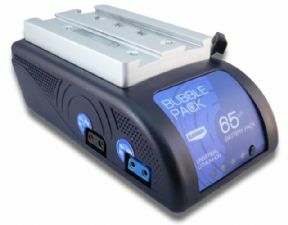 BUBBLEPACK is the universal battery designed for medium and small camera applications which can easily be used also with handheld and DSC cameras and also with shoulder mounts. under a camera body, where a handy sliding mechanism has been provided for fast detachment. The whole arrangement can all be mounted on a tripod. with the convenient V-bracket adapter BPVB, can be installed similarly to a V-Lock battery, for example on a shoulder mount support system. 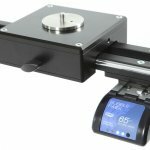 through the belt mount adapter BPBM, can be hooked to the belt and used with more freedom. 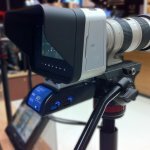 Wide choice of cables and adapters available for rigging to a variety of cameras and solutions. 4 LED gauge for displaying remaining power. 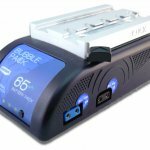 Uses 65Wh high quality Li-ion cells for prolonged lifetime. Dedicated charger provided for 2hr fast charging.